Shamrock Rovers youngster Gavin Bazunu has reportedly agreed to join Man City. AMID THE BEGINNING of the new Premier League season, there has been some familiar soul-searching from an Irish perspective. Just eight Republic of Ireland players started in the opening weekend of the Premier League, and at a generous estimate, roughly 15 have a realistic chance of featuring regularly in the forthcoming campaign. The marginalisation of Irish players at the top level of English football has been well documented of late, with a dramatic dropoff over the past five years in particular — as many as 33 Irish players started at least one Premier League game as recently as the 2011-12 season. Nevertheless, Niall Quinn — who was announced today as part of Virgin Media Sport’s punditry team for the forthcoming season — is remaining relatively optimistic about “a couple of green shoots of recovery”. 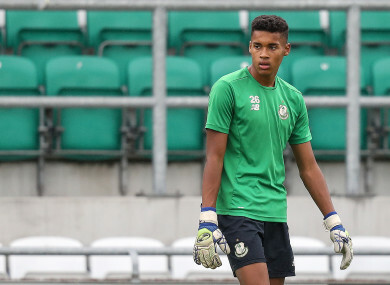 He cites 16-year-old Shamrock Rovers goalkeeper, Gavin Bazunu, in particular, as a sign that clubs and players are learning from past problems. According to reports, the promising teenager has agreed to join Manchester City for €400,000, but will sit his Leaving Cert before moving across the water. In the past, there have been instances where Irish youngsters’ education has suffered owing to the lure of moving across the water, but increasingly, the teenagers in question are either rejecting or postponing moves to England in order to prioritise off-the-field matters. To cite two examples, Ryan Manning deliberately waited until he was older to join QPR, while UCD’s teenage starlet Neil Farrugia has spoken of turning down the advances of English clubs to focus on his development in Ireland. Bazunu’s case, which of course is slightly different to the others mentioned, is the most high-profile, and Quinn is encouraged at the path that has been laid out for him. “When you see the young kid at Rovers going away. When you see the young kid at Liverpool from Cork who is in around the first team; that has to give you great hope that there is ability about the young players in this country when you look at them and ask what advantages or disadvantages do they have as clubs come to look at them. “I remember talking to [the former footballer who is currently on the executive staff at Manchester City] Brian Marwood, who had a fear a couple of years ago at Man City that they were getting the Irish kids too late, but yet this one they have gone and paid for, then allowed him to stay and do his Leaving Cert. Quinn also feels that this different approach of keeping players in Ireland until they are 18 can potentially be better for them both in footballing and psychological terms, and the former Ireland striker hopes the Bazunu move will help set a new trend that will result in more long-term success for Irish footballers. “It’s no good us talking here about the emerging talent and how we can do this or we can do that… It’s no use us saying it, it needs those clubs to say it. But if you can build up a form of development so that English clubs can say: okay, he’s come through that, that’s grand, we now know what we have, then you get to the stage where they get their education and to develop as a human being, then your failure rate, that horrific failure rate of Irish kids going over, then you’ve got a chance. Niall Quinn will join Graeme Souness and Kevin Kilbane as part of the punditry team for Virgin Media Sport’s European Football coverage. More info here. Email “'It is a defining moment. This is the first club that has paid a lot of money for a kid then allowed him to stay in Ireland'”. Feedback on “'It is a defining moment. This is the first club that has paid a lot of money for a kid then allowed him to stay in Ireland'”.